Michel Baudin‘s comments: Overall, I agree with Bob’s assessment, but I think American manufacturers deserve more of the blame than the LEI, for faddishly latching on to one tool after another and mistaking it for a panacea. For example, in his introduction to “Learning to See,” Mike Rother explicitly warns the reader that, at Toyota, Materials and Information Flow Analysis (MIFA) is not a major tool. Yes, he repackaged it with the attractive but nonsensical name of “Value Stream Mapping” (VSM), but his audience didn’t have to elevate it to the status that it did. 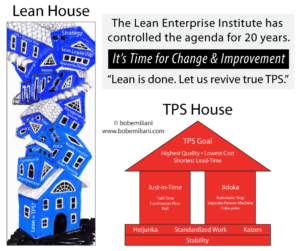 Is There An Ethical Dimension To Lean/TPS? In Toyota’s Guiding Principles, last revised in 1997, Michael Ballé sees more than “goal-oriented efficiency.” While I would not use a phrase like “goal-oriented efficiency,” the principles do not strike me as anything beyond strategic guidelines to ensure the long-term, worldwide viability of the company. If they serve this purpose, great, but a car manufacturer is the wrong place to look for philosophical enlightenment.